A Better Way… Diagonally? – "I KNOW TORONTO!" 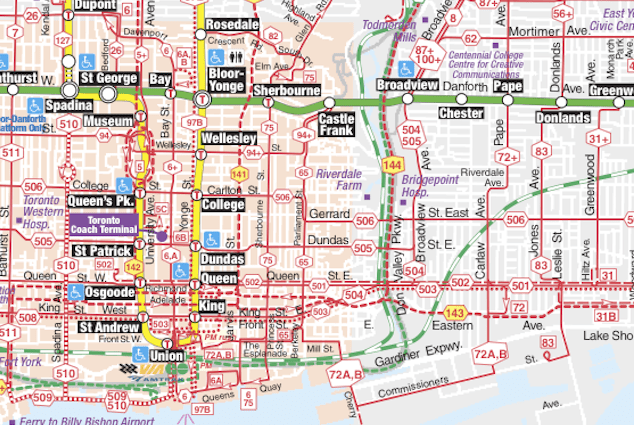 The Grid has published a really interesting piece comparing some of Toronto’s bus routes and transit with London. While Toronto is built on a grid, getting from one place to another can require multiple transfers, while London has bus routes that hit popular locations. Stuart Berman poses the question: If we can’t have new subway lines or a light-rail transit network, then why don’t we at least reorient our bus routes to where Torontonians want to go? When it comes to improving public transit in Toronto, there appears to be little light at the end of the tunnel. New subway lines are prohibitively expensive to build. Light-rail transit infrastructure is relatively less expensive, but our mayor doesn’t want it. And with the City demanding budget cuts for 2012, the TTC has had no choice but to raise fares and consider service reductions. (The news out of City Hall yesterday eased the pain somewhat, but some three dozen bus routes will still be subject to changes.) However, even in these lean times, there is still one variable that the TTC can manipulate to potentially improve service: redirecting where our buses actually go.